On a recent trip to Washington, D.C., Flower Shop Network’s Brock and Loranne Atwill had the opportunity to visit with other florists as well as lawmakers to discuss issues facing the floral industry. Working with lawmakers to overcome those issues is an endeavor Brock and Loranne feel is important. 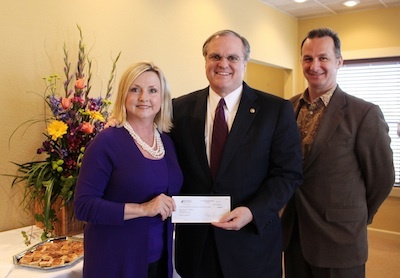 To learn more about how FSN is working with lawmakers read SAF’s article SAF Members Host Fundraiser for Arkansas Senator. If you look through the phone book there looks like there is 10 to 15 florist in a area were in fact their is only 2, I fell that the only florist listed should be the actual florist with a physical address, not companies that purchase a name like yours but their company is in another state. I agree with “Cathy Clark” the order GATHERS are killing our mom & pop florist !!!! Even the whole MEMBERSHIP GAME is ridculous !! They recieve Membership fees , a cut on every order they send to you , advertising and other fees as they state and then expect you to fill the orders at or below wholesale costs !!! If you do not you are FINED ETC>!!!! Thats why I am only with FSN where I have the controll on every order ! After all it is my name on every enevelope that goes out of my store. I PRAY that something changes for “US” little guys just so we can continue doing what we are so passionate about !!! I’m so appreciative of FSN; they ARE here to help florists. That said, I wish they could toss some devs into a think-tank and then reach out to funeral directors. The order gatherers have all crawled into bed with the online obituary sites and most every mortuary website in existence. Funeral orders are our bread and butter and we’re completely cut out of the loop if we’re not an affiliate of TF or FTD. I agree with all the above, but also have an issue with the local Walmarts, and Supermarkets in general. We are not allowed to sell food or alcohol, so why are supermarkets allowed to sell fresh flower bouquets, arrangements, plants and the like. Our last Mother’s day was really reduced due to a local market loading their store to the brim with cut bouquets and arrangements that were cheaper than we can even purchase product at! We work so hard and these box stores are killing the industry as well. Guess I need a liquor license next. I agree with all of you. The order gatherers should be illegal! You should not be able to take someone’s money for a product you don’t have and can’t get. I am a florist on Main Street in a small town and it is discouraging to have to compete with the grocery stores and order gatherers. I love that fsn offers such great rates to have such nice websites and total control over pricing and what I offer. I love that I am in control and how very helpful they always are.